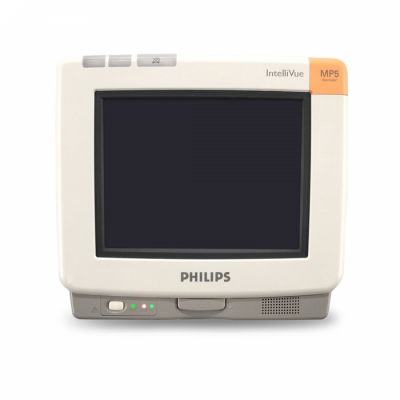 The Philips IntelliVue MP5 Patient Monitor is a compact but functional monitor that has an intuitive touchscreen with built-in clinical measurements. It has a user-friendly interface that enhances visibility of patient data and makes navigation easier with one-step smart touch commands. Philips IntelliVue MP5 is portable patient monitor that has a 8.4-inch touchscreen display and one-touch commands for easier machine operation. Its horizontal split-screen displays real-time waves to make deviations more apparent and when connected to an XDS software, an XDS remote can be used to control it. Its Dynamic Wave feature automatically adjusts the size of waves depending on the configured number of waves. It has an optional 3 to 10 electrode ECG monitoring and 12-lead ECG monitoring with 5 electrodes using the EASI method or with 10 electrodes using the conventional method. It also has optional features on measurements of common parameters such as ECG, SpO2, NBP, choice of two invasive pressures and temperatures, choice of CO2 monitoring and anesthesia modules. It can be connected wirelessly and its optional wireless telemetry provides untethered in-room access to ECG/SpO₂ data. It can connect to MX40 via short range radio for additional vital signs parameters and continuous monitoring.